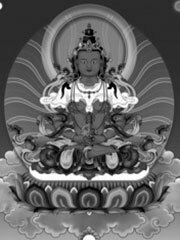 Madhyamaka is a Buddhist philosophical tradition that asserts that all phenomena are empty of «self-nature» or «essence» (Sanskrit: Svabhāva), that they have no intrinsic, independent reality apart from the causes and conditions from which they arise. Madhyamaka is the rejection of two extreme philosophies, and therefore represents the «middle way» between eternalism (the view that something is eternal and unchanging) and nihilism (the assertion that all things are intrinsically already destroyed or rendered nonexistent. This is nihilism in the sense of Indian philosophy, and may differ somewhat from Western philosophical nihilism). The Svatantrika Madhyamaka, who differed from the Prasangika in that they believed conventional phenomena could exist for themselves without existing ultimately. Thus they felt that positive assertions in logical debate served a useful purpose, and did not restrict themselves to using only prasanga methods. The Prasangika Madhyamaka, whose sole avowed technique is to show by prasanga (or Reductio Ad Absurdum) that any positive assertion (such as «asti» or «nāsti», «it is», or «it is not») made about, or view proclaimed of, phenomena must be regarded as merely conventional (samvrti or lokavyavahāra). Therefore there is no position that constitutes the ultimate truth (paramartha), including the views and statements made by the Prasangikas themselves, which are held to be solely for the purpose of defeating all views. The Prasangikas also identify this to be the message of the Buddha who, as Nāgārjuna put it, taught the Dharma for the purpose of refuting all views. The Yogacara Madhyamaka, which asserts that all phenomena are nothing but the ‘play of mind’, and that mind, thus, is the basis of everything.